Over one hundred years ago a group of six students and one IU staff member made headlines– but not for sports or academic achievement. They were the late nineteenth-century version of a resistance to what they saw as outrageous misconduct and immoral behavior on the part of IU faculty members. Their actions uncovered a scandal in 1884, became campus folklore, could be said to have changed the course of Indiana University’s history, and today are largely forgotten except by those who study IU history. So, who are they? The Moss Killers. Thomas “Uncle Tommy” Spicer, the janitor. Together these so-called “Moss Killers” didn’t actually kill anyone (or any fungi), but they managed to uncover and prove a scandal that lead to the resignations of the university president and of a Greek professor. As a result, the University trustees and legislators broke with the past traditions of moralism and classicism and moved toward new educational leadership and an embrace of the intellectual age and academic reform needed for sciences and modern professions that was already present in many other American universities at the time. The Moss Killers, 1884. Archives image no. P0024044. (Standing in back row, L to R) James Zwingle Alexander McCaughan, David Kopp Goss, Joseph Woods Wiley, and Rhorer Oakes. (Seated in front row, L to R) Edward A. Hall, IU janitor “Uncle Tommy” Thomas Spicer, and Morton William Fordice. 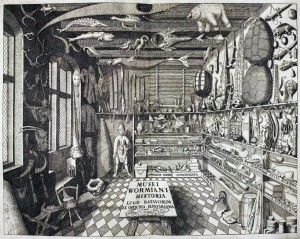 The inscription written in Latin with a lead pencil on the back of this photograph and the English translation of the Latin reads: Septem Muscicidae. Hic videas Septem Muscicidas. Et Aspice Tela Muscicidarum. Seven Moss-Killers. Here you see seven Moss-Killers. And look at the weapons of the Moss-Killers. Rev. Dr. Lemuel Moss was the sixth president of Indiana University and one of the last in a line of six “Preacher Presidents,” who served the university before Indiana University followed the lead of other American colleges and began to employ presidents more focused on educational philosophy and public responsibility rather than theology or moral instruction. Moss was at the University of Chicago before coming to Indiana University, and he had previously served as the Pastor of a Baptist Church. As University President at IU, Moss was known to be a popular public speaker and a strict disciplinarian. Between 1880 and 1884 he was also a member of the National Council of Education, vice president of the American Baptist Missionary Union, president of the department of higher education, and a part of the National Education Association. However, his prolific career in higher education was to be interrupted as a result of the Moss Killers. Miss Katherine Graydon, a young woman in her mid-twenties, began work as a professor of Greek at Indiana University in September of 1883. She was an attractive, charming, and intelligent young woman. The rumors regarding her relationship with Rev. Dr. Moss quickly began soon after the start of her appointment. After months of suspicion and rumor, the “Moss Killers” formed from a group of undergraduates to find out the facts concerning the relationship between Dr. Moss and Miss Graydon. With the help of Uncle Tommy (the janitor), the six young men used a hand drill to cut a hole in the ceiling above Miss Graydon’s office and the Greek classroom in the University building. They stood watch to see what happened in the room below. And eventually they saw what had been rumored to be true. The Moss Killers then presented sworn affidavits and charges of “improper and immoral conduct” between the University President and Greek professor to the University Board of Trustees on November 7, 1884. Charges against the President of the Univ. The digitized and encoded Board of Trustees Minutes can be seen and searched here. The students told the Trustees that they saw Moss present Miss Graydon with gifts and greet each other in ways that were not at all professional. What was once rumor was now full blown scandal, and an investigation began by the Board of Trustees. They planned to hear evidence on the matter from both Moss and Graydon on Tuesday November 11, 1884. But, before a hearing or investigation could commence, both Dr. Moss and Miss Graydon presented their resignations abruptly on November 8, 1884. Toronto Daily Mail. November 18, 1884. The story grew and spread, damaging the reputations of Moss and Graydon. Newspapers carried the affair far and wide. The Toronto Daily Mail, Tuesday November 18, 1884 (excerpt seen to the left) ran a detailed story entitled A Grave Scandal: Involving the President of Indiana State University. Well Known to Citizens of Toronto. An Investigation to be Held Upon Charges of Unseemly Conduct. The social repercussions of the scandal were more problematic for Moss and Graydon than they were for the university. Some say that the newspapers inflated the story before Moss resigned. In any case, the damage had been done. After her resignation and after a later attempt to rescind her resignation, Katherine Graydon moved to Indianapolis permanently. She was the member of two prominent families, the Merrills and Ketchams, who became extremely defensive of her even when the congregation of her church became involved in the public judgement. In the end however, her defenders won and Miss Graydon became a well respected professor at Butler University and went on to have a long career there. Dr. Moss was not so lucky. After his resignation he quickly left Bloomington. He spent some time in Chicago at a manufacturing firm, then worked editing a religious magazine, later spent time in Philadelphia, and was also a professor of Christian sociology at Bucknell. Dr. Moss died in New York in 1904 at 75 years old. The Moss Killers, the scandal and affair they uncovered, and Dr. Moss’s resignation created some chaos at Indiana University. The role of president was filled temporarily by Elisha Ballantine, much to everyone’s approval. The University then went on to search for the right new president. The Board of Trustees needed to keep up with the times, and they needed a university president who could lead Indiana University into the new age of American intellectualism and science. The Moss Killers may not have killed anyone really, but their actions damaged one man’s reputation permanently, and ushered in a new era of leadership at Indiana University. When most of us began college, we never expected to have to attend any kind of prayer service or religious exercise. Such activities have always been a choice for our generation. Millennials may have gotten off easy though. We’ve grown up in a time when religion has had little influence on our public education. But this wasn’t the case for the IU students of the early 19th century! Until after the 1887-1888 school year, students were required to attend religious services at the chapel at IU. Throughout its existence in different locations as a State Seminary, as the Indiana College, and finally as Indiana University, the campus has had a long relationship with chapel services. Student attendance and excused or unexcused absences were meticulously documented in the Chapel Roll. A large brown leather bound book, the Chapel Roll is a record of student names, their rank as seniors, juniors, sophomores, or freshman, and their attendance at the mandatory chapel services from 1883 until 1891. It is interesting to look through the pages and see the numbers of students in each year and to try to decipher the chapel’s attendance system. Though the ornate writing in the book is attractive at times, it was likely a record that many students would have disliked. Most of us now probably can’t imagine having to sit in a religious service every day as a part of the college experience. And as student attendance was mandatory, any unexcused absences may have had consequences for early Hoosiers! The First University Building ca. 1856, also known as the Old College Building was used to house the Chapel, several academic departments, and other activities. A room in this building served as space for the Chapel from 1856 to 1896. Though the location of the chapel and the content of the services eventually changed, and even though attendance was no longer required after the school year of 1887-1888, the Chapel Roll still kept a record of attendance for the difference activities held at the chapel. It can be found at the IU Archives. Contact the IU Archives to schedule a visit to view the Chapel Roll in our reading room. You never know what you will find when you dive into a box of Folklore papers. Much like a Cabinet of Curiosities from the Renaissance and Victorian periods (see left) these boxes are stuffed full of papers and items that will spark one’s curiosity, wet one’s intellectual appetite, and engage the mind in cultural history. The University Archives recently processed a collection of papers written by students taking material culture courses in the Folklore Institute between 1960 and the early 1980s. 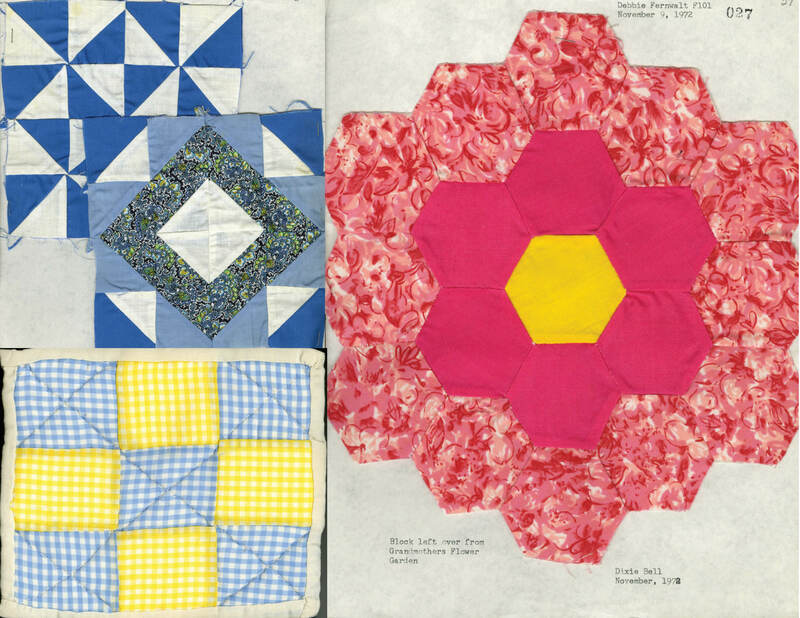 These papers are written on a wide variety of subjects within material culture including architecture, crafts, tombstones & epitaphs, quilting, furniture, instrument making, family traditions and recipes, fashion, and food ways. Many of these papers consist of interviews with artisans and craftsmen, family members, or owners of the locations being researched. One such paper includes an account by the owner of a house near Elizabethtown, Indiana which was part of the Underground Railroad used by runaway slaves fleeing north to Canada during the Civil War. A number of the locations and craftsmen discussed in these papers are local or in close proximity to Bloomington, including a paper on the Rose Well House which is a popular fixture of legend in IU campus lore. For those more interested in religious studies there are also papers centered around religion. 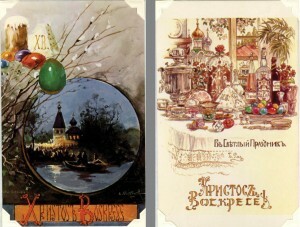 One such paper describes the folkways surrounding food, feasting, and religious practices of the Russian Orthodox Church during the week of Easter and recounts how the low number of parishioners at Bloomington’s Russian Orthodox Church affected the Bloomington orthodox community in the 60s and 70s. 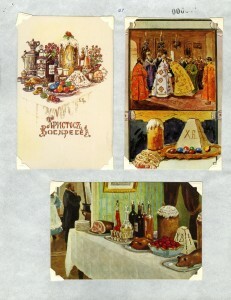 The paper even includes a set of colorful feast-themed Eastern Orthodox postcards for the reader to examine (see here). I would be curious to see if the church survived or not but I couldn’t find it through any direct means…perhaps that is an answer in it of itself. Sometimes going through papers from various years allows the researcher to see trends. Apple doll making and water witching seem to have been popular subjects in the 60s and 70s. There are also a fair number of papers written on local tombstones and instrument makers in this collection. Most of these papers will include samples, photographs, or other items related to the paper’s subject. 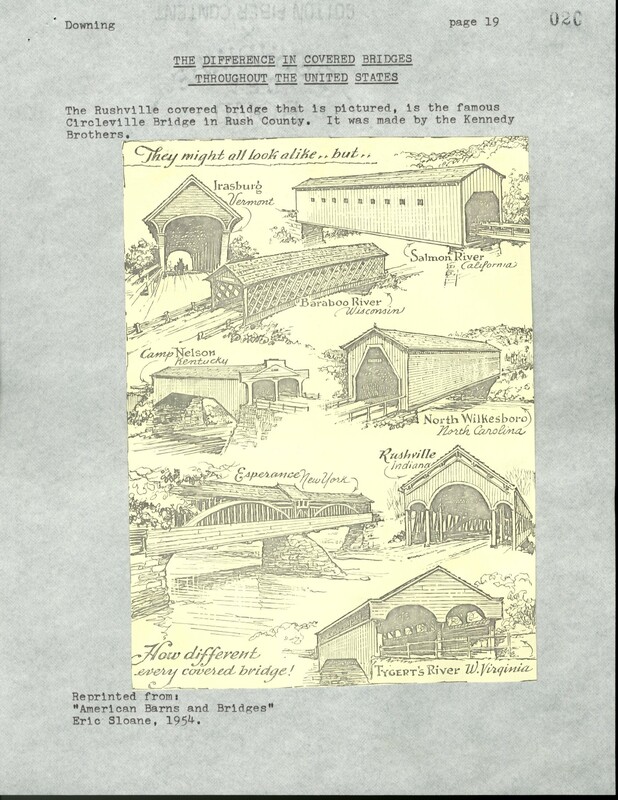 One such paper written on the Kennedy family, who built covered bridges in Indiana, has a beautiful set of covered bridge illustrations and diagrams as well as old advertisements for tools used to construct these bridges. magazine pictures, samples, or hand drawn patterns to help explain the types of patterns being discussed (see here). For more on these papers and other Folklore-related items contact the IU Archives. The archive of a long-term ethnographic study of Hungarian ethnic identity is now available for perusal at University Archives and Records Management. The study, facilitated by Indiana University’s Folklore Institute in the early 1980s, examined the ways that Hungarians in both Hungary and the American Midwest maintained senses of community through everyday customs. This project led to an academic conference, a special issue of the Journal of Folklore Research, and a rich collection of photographs and fieldwork reports. And that’s where the official story starts to get personal, at least for me. Sorting through the papers of the Hungarian-American project over the past couple of weeks was an exercise in self-reflection. 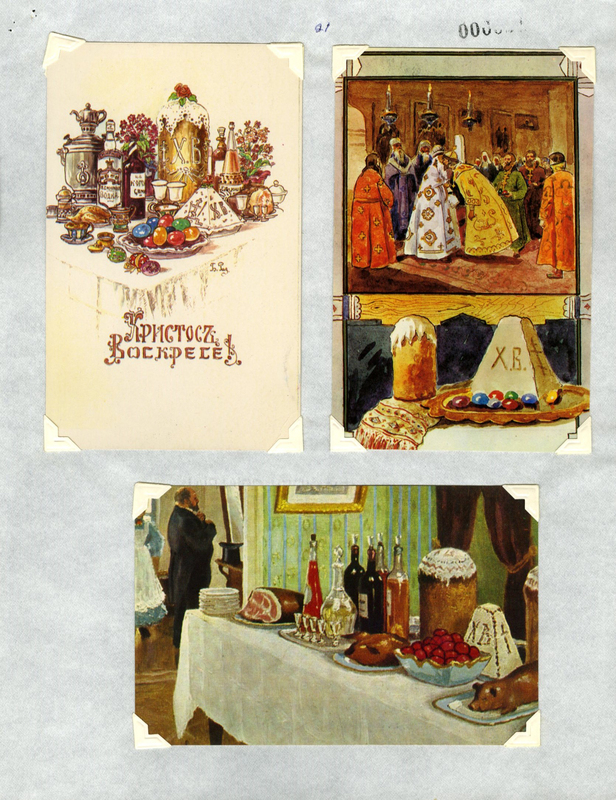 As the research team documented ethnic foodways and days of religious observance among Hungarian culture groups, I recalled my own encounters with similar sorts of traditions during my childhood. My mother’s side of the family has always held on to certain pieces of its Slovak heritage, from the practice of Roman Catholicism to the hearty peasant food that characterizes our communal meals. Sauerkraut, sausage, and the sign of the cross are comfortable bedfellows in my mind. In fairness to the academic persona that I’ve spent the past five years cultivating, this kind of musing makes me recoil a bit. Though they are neighbors, Hungary and Slovakia are distinct nations with distinct cultures. From a scholarly standpoint, it does not do to lump them together so indiscriminately. On the other hand, the human in me gravitates toward what I recognize as a resounding articulation of home. The people I grew up with behaved like the people whose lives are documented in the Hungarian-American project archive. It was impossible for me, while browsing these papers, not to be reminded of grandparents, aunts, and uncles. Here’s a case in point: My great-grandmother, Mary Slota, left Slovakia for northeast Ohio in the early twentieth century. One of my favorite family photos shows her in her kitchen, proudly displaying a ring of homemade hurka, or blood sausage, probably harvested from a hog that was raised on the small farm where she lived with my great-grandfather. One of the hundreds of photos in the Hungarian-American project archive shows a widow in the Hungarian village of Cserépfalu. Babushka tied around her head, she leans over a bowl while plucking a chicken, presumably in preparation for a meal. Captured in the photographic frame, both women illustrate the cultural moment they inhabit. They wear floral patterned aprons and work with ingredients that exemplify a farm-to-table attitude long before that phrase became trendy among the culinary elite. And while Mary Slota and the villager from Cserépfalu spoke different languages and lived in different places, their everyday lives were more like than unlike. That the archival material of the Hungarian-American project speaks so insistently to my own experience is, in my opinion, an indication of its success. Project researchers mindfully collected images and words to produce a body of data that is greater than the sum of its parts. While the project’s focus was Hungarian ethnic identity, the amassed data recalls the larger experience of eastern and central Europeans in the twentieth century. One can come to this conclusion on a personal level, as I did with my photo comparison, but it is also possible to approach the issue conceptually. Apart from the photos, the Hungarian-American project archive contains many documents that attempt to analyze the immigrant experience. Here are some of the questions they pose: What does it mean to be “ethnic,” anyway? Are Hungarians only ethnic once they have left Hungary? Is culture something people inherit or something they create? What about tradition? Does it have to stay the same, or are we allowed to change it? There isn’t enough space to describe the researchers’ conclusions here, but the good news is that six boxes of documents await anyone who wants to know more. To gain access, or to view the finding aid that indexes the Hungarian-American project archive, visit our website at http://libraries.iub.edu/archives, or call (812) 855-1127. The pressing need of national unity today makes it imperative that religion become a unifying force rather than a divisive one. The common ground of various faiths must be cultivated. All faiths must go harmoniously together as far as they can. Between all the religious units of the campus efforts must be made to create the mutual understanding and unity resulting from a common belief in democracy and in the ideals of liberty and a common God. Soon after its organization the Cabinet set up five special interest groups, officially known as commissions on Inter-Racial Fellowship, Social Creed and Action, Peace Education and Action, Personal Religion and Worship, and Inter-faith Fellowship and Work. Through conferences and seminars, campus publications such as The Voice of Religion, morning group breakfasts, and chapel colloquies, they sought to address the larger social, political, and religious issues of the day such as racial segregation, religious intolerance, European refugee students, and building morale and involvement in wartime activities. On January 29, 1941, during a special banquet in Alumni Hall sponsored by the University Committee on Religion and the Student Religious Cabinet, 1937 Nobel laureate Dr. Arthur Compton spoke on “A Scientist’s Conception of God.” Following the lecture, university President Herman B Wells stood before over 400 members of the faculty, student body and the public to announce a generous gift from Frank and Daisy Beck to construct a chapel for those of all faiths on the campus. The Board of Trustees accepted the gift shortly thereafter, and the university architects presented a conceptual drawing for the proposed structure. Unfortunately, due to the war-time scarcity of building materials the construction of the Chapel was delayed by several years. Finally, as part of commencement activities on June 12, 1954, the ground was dedicated, two years later the cornerstone laid, and the official dedication ceremony followed during Commencement activities on June 9, 1957. Almighty God from whom every good prayer cometh, and who poureth out on all who desire the spirit of grace and supplication, deliver us when we draw nigh to thee, from coldness of heart and wandering of mind. And when they go out keep them amidst the perils of their uncertain way. We pray that by faith we may see the needs of those who will come after us, to bequeath to them a rich heritage, and to share with them the widening vision. Planted in a Triangle, may these trees ever symbolize to us the harmony and unity that should dwell among us, and, above all the divisions, of our imperfect society, assert the Brotherhood of man. Within the Chapel sacristy are housed the holy symbols and scriptures of all the world’s religions including a rare copy of the Koran hand-painted in gold; the book of Genesis written in Hebrew and printed from wood-cuts in Rome in 1578; The Dahamapada, the Canonical Scriptures of Buddhism; a Torah; and a Bible. The Venerable U. Thittila, Professor of Buddhist Philosophy at the University of Rangoon, Burma with Dr. Beck examining holy vases from Korea and a historic copy of the Koran. Extremely rare copy of the Koran, a gift of Izziddees Rawi, Ph.D, 1951, of Baghdad, Iraq, which was presented by Ziad Keilany of Syria and Sinan Rawi of Iraq. …does not aim to resolve religious differences, or to seek religious compromise, or to reduce faiths to the lowest common denominator. On the other hand it holds a sensitive regard to the rights of varying religious opinions and seeks to encourage respect for the ethical and religious values of each of the historic faiths represented in the student body and faculty. It strives to unify by contending that all differences of religion are subordinated to a higher and more comprehensive agreement: that truths high enough are sure to meet. It strives to establish that all true religions seek sufficient depth and universal outlook to rise above all differences; and that with the oneness of mankind as the central problem of the age, we come nearer to God as we come nearer together. Thus, the Chapel will not become the chapel of a common creed, but the chapel of a common quest, granting free and full expression to each faith represented on the campus, with each faith enriching others by the differences of faith and function. Today, the Chapel continues to serve as the home for those of all faiths, with services held representing the Christian (Catholic and Protestant), Jewish, Buddhist, Confucian, Hindu, Muslim, Shinto, Sikh, Zoroastrian, Taoist, Coptic and Baha’i faiths. In addition to symbolizing a higher search for religious tolerance and unity on campus, annually the Chapel witnesses the exchange of numerous engagement and wedding vows, christenings, memorial services, devotional services, organ recitals and simply as a quiet place of self-meditation amidst the bustle of campus life. Visit the Archives reading room through September to view the exhibit, or contact an archivist to see the Frank O. and Daisy Beck papers.